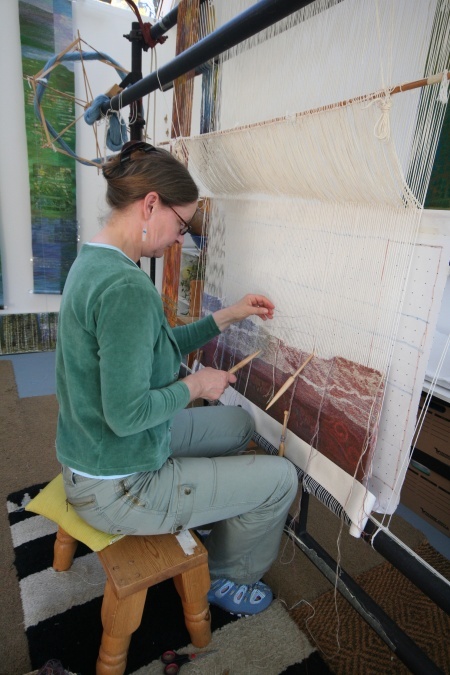 Inspired by the landscapes and heritage of the far north of Scotland where she lives, Joan Baxter uses the ancient technique of tapestry weaving to explore her world. ‘My work is designed to be subtle, thoughtful and subliminal and I intend it to speak powerfully to people on an emotional level. The landscapes of the far north have a particular minimal beauty and are strongly atmospheric. Tapestry designs rarely start with a beautiful view. The origin is usually more nebulous, less visual, often a mood evoked by a place, a text or a piece of music. My interests in archaeology, ecology and history combined with walks to explore these aspects in my local landscapes and other places all feed into what I make. At the outset I have no clear picture of how a finished tapestry will look as the piece develops and changes during the weaving. I find the measured pace and technical constraints of weaving curiously liberating and only when I am weaving do the really good ideas come to me, so my work could never exist in any other medium."